The Health and Wellness faculty recently welcomed a bumper class of postgraduate students to its Computerised Tomography course. CPUT is the only higher education institution in Africa to offer the certificate course and this year the class has students from as far afield as Zambia, Zimbabwe, Namibia and even Ireland attending. Computerised Tomography is a radiography speciality that creates a 3-D image of areas in the body and is more accurate at spotting abnormalities in the body. 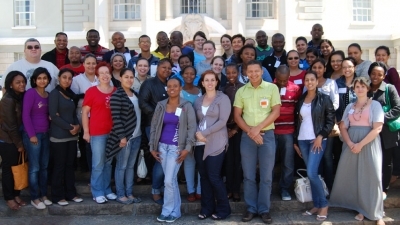 This course is important to industry as it provides an opportunity for radiographers to enhance their knowledge and expertise and stimulates professional development in Southern Africa. The course has been on offer since 2008 but is only offered every two years because of the huge workload required of both lecturers and students. Radiography lecturer Aladdin Speelman says the course enjoys bumper enrolments because of past student recommendations. “We are heartened by the large number of radiographers from industry who wants to improve their knowledge and skills by enrolling for the course. This course is therefore succeeding in advancing the CPUT brand in Africa,” he says. Article issued by CPUT. To visit their profile on SAstudy, click here!